First, put each of 5540 Artemis bead, metal wing and heart, 5000 round bead and rondelle bead onto the head pin. Next, bend the rest of the head pin into a loop by using a round nose pliers. 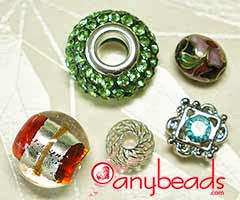 Before you close the loop, hang the spacer bead on it. 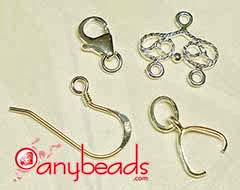 You may need to cut the head pin shorter in order to make a right size loop. Please refer to our tutorial - How to make a loop? Then, put the leather cord and the suede cord together, and enclose one end of the cords with the metal clasp and clip ends set. For a easy way, hang the Angel by pulling the cords through the spacer bead. Now, you can do the same as you did one step before for the other end of the cords. Remember to cut the cords to make a perfect length of your own necklace. How to make a wire loop?